While we are not travel agents, we do live year round in this great state and can make some suggestions about how to put together a variety of rewarding Alaska itineraries. Fly into Fairbanks & overnight at Pike's Waterfront Lodge on the Chena River; take the Alaska Railroad to Denali the following day to meet the Camp Denali and North Face Lodge buses; stay 3, 4 or 7 nights; upon departure, take the Alaska Railroad southbound for Anchorage; enjoy Anchorage and set out for the Kenai Peninsula, Prince William Sound, or elsewhere. Fly to or arrive in Anchorage & overnight at our Parkside Guest House; take the Alaska Railroad to Denali & overnight at Deneki Lakes B&B. The next day meet Camp Denali and North Face Lodge buses; stay 3, 4, or 7 nights nights; upon departure, catch the Alaska Railroad southbound for Anchorage; enjoy Anchorage and set out for Kenai Peninsula, Prince William Sound, or elsewhere. Enjoy Denali by staying at Camp Denali or North Face Lodge and pair it with a unique lodge experience in Kenai Fjords National Park with Alaska Wildland Adventures. Stay for two nights at their Kenai Fjords Glacier Lodge, the only wilderness lodge within this national park. Enjoy a marine wildlife tour en route to the lodge—consider it the marine version of the Denali Park Road! Begin in Anchorage and join Discovery Voyages aboard a very small boat trip for 2 to 6 nights while intimately experiencing the natural wonders of Prince William Sound. Follow up your boat trip with several days at Camp Denali or North Face Lodge for an in-depth Denali experience. Or, reverse and start with Denali, followed by Discovery Voyages. If you only have time for a day trip to Whitter on Prince William Sound, Lazy Otter Charters offers half and full-day boat excursions to view glaciers and marine wildlife. Either before or after experiencing the taiga and tundra of the Interior with a stay at Camp Denali or North Face Lodge, venture to the temperate rainforests of Southeast Alaska aboard a small boat cruise. Alaska Dream Cruises, The Boat Company, and Un-Cruise Adventures offer the opportunity to experience and learn about the rich marine and terrestrial ecosystems of the area, as well as the unique cultural history. Note: You will need to fly between a city in Southeast Alaska (e.g., Juneau) and either Anchorage or Fairbanks. Drive to Denali National Park and leave your car in the free long-term parking area while staying at Camp Denali or North Face Lodge. 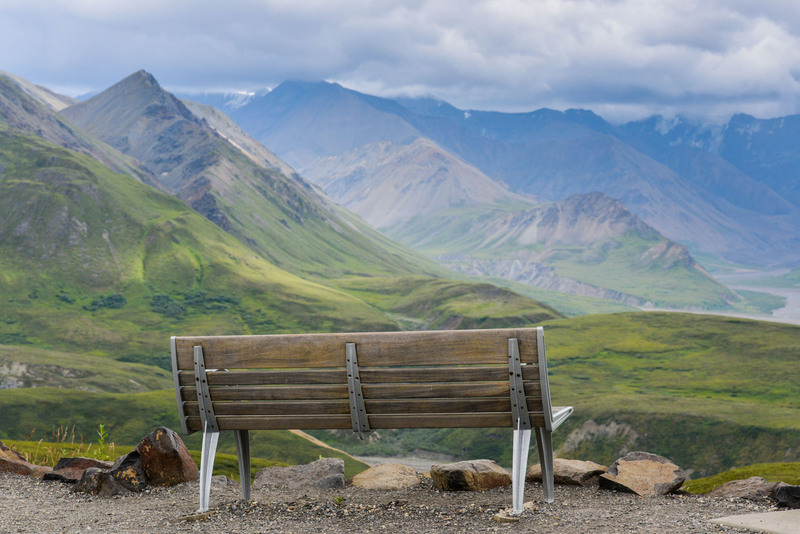 Upon departing, drive the Denali Highway east toward Paxson, then south to Wrangell-St. Elias National Park. Stay at the Kennicott Glacier Lodge near the historic copper mine in Kennicott, or at another accommodation in the quirky town of nearby McCarthy, located inside the national park. Travel in Alaska’s Arctic is always an adventure. Northern Alaska Tour Company is an Alaskan-owned tour operator based in Fairbanks, Alaska. They provide travel and touring experiences in Alaska's Arctic. Join a multi-day wilderness river rafting or backpacking trip above the arctic circle in the famed Brooks Range through Arctic Treks. Or design your own custom adventure through the Alaska Interior with Traverse Alaska. Follow up your expedition with some comforts by staying at Camp Denali.